New Game “Conviction” Delivers Sweet Judicial Justice to President Trump & Co. Frustrated with the presidency? Wish you could serve up some justice? 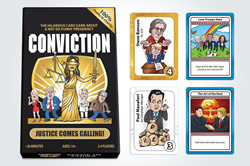 Play a game of Conviction (http://www.GetConviction.com), the new satirical card game letting you and your friends convict President Trump and his cronies for their crimes against the country. Launching exactly one year since the election, Conviction chronicles the events that have transpired since President Trump took the helm. All profits from the sale of Conviction will be donated to causes under attack by the Trump Administration. Created by game enthusiasts and best friends of 20 years Dan Peterson and Neil Patel, Conviction puts key public figures on trial in front of Lady Justice herself. The goal? Get the most points by convicting the highest-value public figures. The player with the most points wins and saves America. From Ivanka and Jared to Betsy DeVos and Paul Ryan, the gang’s all included and ready to be convicted. After the 2016 election, Peterson and Patel found themselves oscillating between scared and angry...but mostly frustrated. One-hundred percent of the profits from Conviction’s sales will be donated to causes endangered by Trump’s current and/or proposed policies, such as: Affordable Housing, Affordable Quality Healthcare, Campaign Finance Reform, Civil Rights, Clean Energy, Climate Change, Education, Environmental Protections, Financial Regulations, Gun Control, LGBQT Rights, Net Neutrality, and Women’s Rights. Peterson and Patel will publish Conviction’s tax returns along with receipts of all charitable donations on the Conviction website http://www.GetConviction.com ensuring the profits are properly donated. Unlike President Trump. Order Conviction today at http://www.GetConviction.com for $24.99. The game ships at the beginning of December in time for the holidays. Complete rules can be found at: https://www.GetConviction.com/pages/rules. El Pen, the parent company of Conviction, was formed to fund causes currently under attack by the Trump Administration. In the first three months, more than 250 people contributed over $25,000 on Indiegogo’s Generosity platform for human goodness to fund the game’s creation and production. Dan Peterson is an advisor to emerging start-ups in San Francisco, is a former product manager at Google, and led product design at Leap Motion. Neil Patel currently leads a Chicago-based consulting and investing firm. For more information, visit http://www.GetConviction.com.